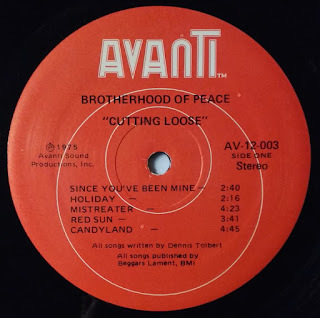 The Brotherhood Of Peace was a Mount Airy, North Carolina-based rock group from the 1970s that had a lone LP out on the private Avanti label called “Cuttin’ Loose” released in 1976. They played everything from hard rock to dance tunes, power ballads, southern rock and power-pop. 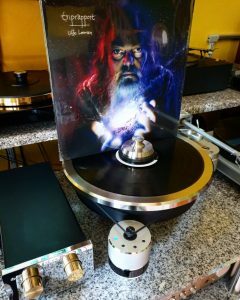 Their LP was recorded by Don Dixon and Robert Kirkland of Arrogance, and recently I was lucky enough to score a copy at a local record store. I figured I’d try and track down the band to find out more information and found Dennis Tolbert, their guitarist and singer, who still plays live with his Dennis Tolbert Band. He was glad to talk about his time in Brotherhood Of Peace. When and where were you born? Tell me a little bit about your upbringing. I was born in Mount Airy, N.C. Dec. 13, 1952. Grew up with two older sisters in a hard working, dedicated family. What got you started playing music? What was your first instrument, and what influences inspired you to start playing music in the first place? First got interested in music in church. Singing and learning pitch and harmony. Listened to the radio a lot. AM radio that is. Liked all kinds of music: real country music, pop and even contemporary stuff like Burt Bachrach, along with Elvis and Johnny Cash. Watched Ed Sullivan, the Johnny Cash Show, any variety show that had musical performers. When I saw the Beatles on Ed Sullivan I thought taking music to that level would be cool. Didn’t we all? At first I thought I wanted to be Ringo. Loved the beat, still do. Got a snare and cymbal kit and loved it. Even did a 6th grade talent show as a member of the Beatles, as Ringo. There’s a picture somewhere. That next summer, my family went on vacation to see my cousin. He had been learning guitar. He put on a Chet Atkins record and played notes along with it. Wow! I was impressed. Mom and Dad saw my interest in it and Dad made me a proposition. He said he would get me one if I learned to play it. That Christmas, he got me a TrueTone from Western Auto. I think it was $20, a lot of money then to spend on something you didn’t have to have. Another local guy, Don Estes who was already in a band, showed me some chords and theory and like Bryan Adams said, I “played it till my fingers bled”. I worked hard at school and after I did my homework, I’d pick up the guitar and place the rest of the day. My Mom and Dad were older than most kids folks so we shut down and went to bed early. I learned more chords and phrasings and started learning “by ear”. I would find a good station on the radio and try to play every song that came on, regardless of what kind. I learned variety and applied all of it to performing and writing. 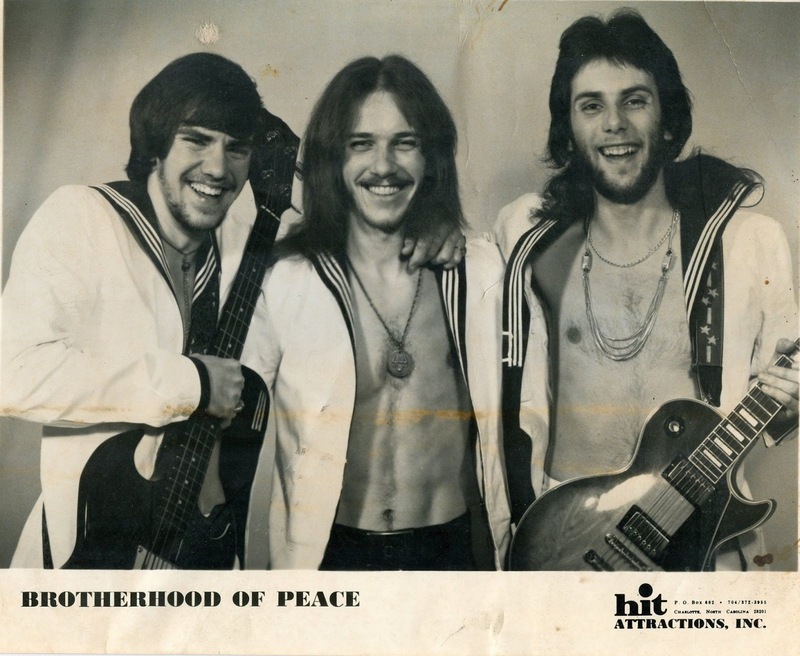 Before you formed Brotherhood of Peace, what bands were you in? Tell me about the music scene in North Carolina at the time. I was really only in one real band before Brotherhood Of Peace. I think it was ‘68 when I joined some school chums who already were playing as rhythm guitarist, back-up vocals and tambourine and maracas. We were called the Casuality Company and we actually traveled around with our equipment in an old Cadillac hearse. Had a strong versatile singer who played bass, a young, talented lead guitarist who had a big sound, and a drummer who was a creative genius. The oldest was 16. None of us could drive. The drummers Mom took care of the bookings and drove us around. 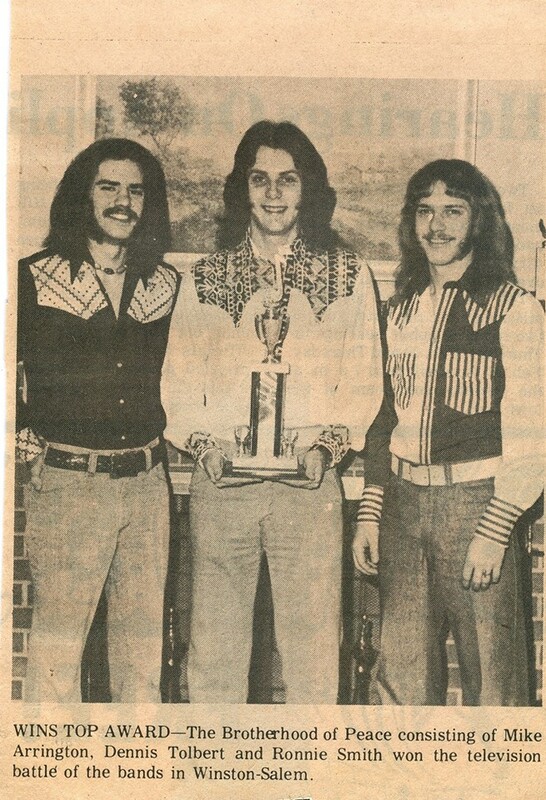 First time we played out, we won a “Battle Of The Bands”. $20 each we came home with that night. When I got home around 11:00, Mom and Dad woke up to ask me how we did. When I told them that we had won and showed them the $20, Dad said, “If you’ve found something that you love to do and get paid to do it, you should stick with it”. I was 15 years old. 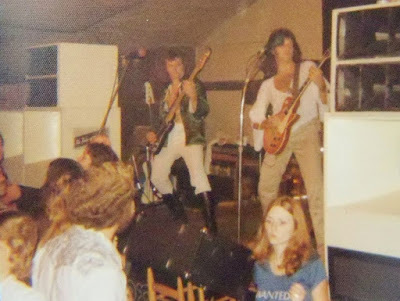 We played school auditoriums, gymnasiums, cafeterias, YMCA’s, other school functions, dances, proms and etc. We weren’t old enough for clubs yet. People came from everywhere around the towns that we played in. Rock and Roll was growing and spreading out in N.C. at that time. 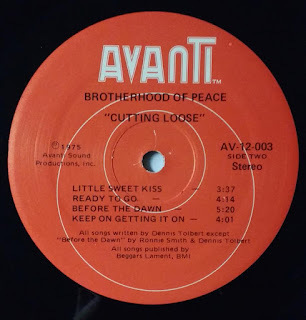 In ‘69, I joined a chorus group that sang a variety of styles, pop, religious, patriotic (yes my friend, proud of our Country) and even some more rockin’ stuff. The group was called The New Americans. Sometimes there were 20 of us and at times, as many as 50. 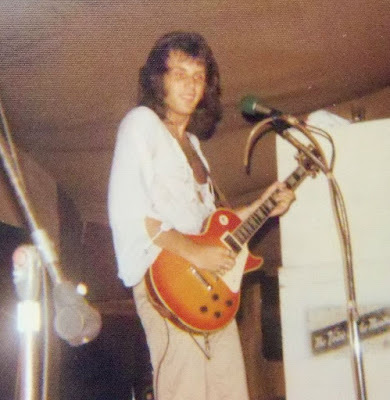 Played to the largest audience in my life at 16. Atlanta Stadium, between a doubleheader of the Braves and the Mets. 55.000 people. I still remember the waves of applause how they come out of nowhere and just stay there. I was getting a real taste for it now. Next we decided that we wanted a rock band to back-up the singers. I put together a group within the chorus and called it the Brotherhood Of Peace. The name was the title of a song that I had written. There’s a 45 out there somewhere. It was recorded in Winston Salem at Hubert Hinson’s studio. I also did 2 albums with the New Americans during this period. By 1970, we were ready to move on as a band on our own. After a trial run with 6 members, we eventually settled on the trio. 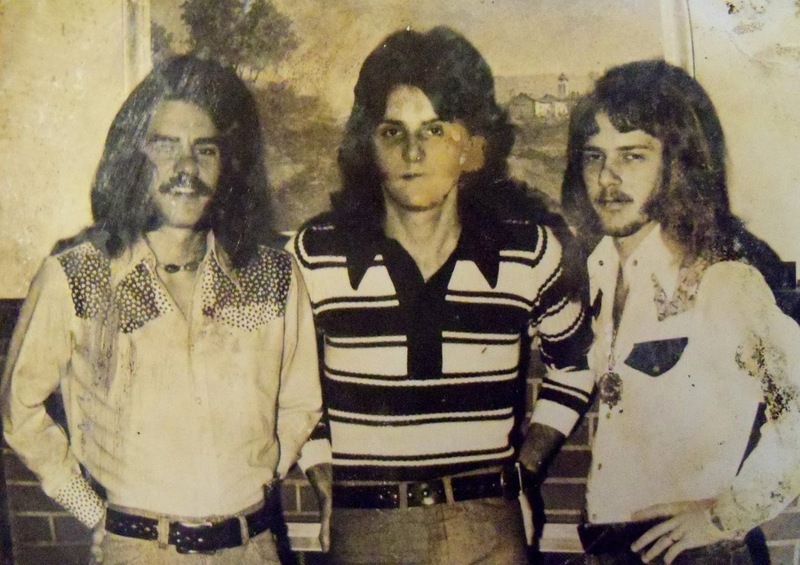 Russell Frye, bass and vocals, Ronnie Smith, drums and vocals and me on guitar, keys and vocals. By then, I had taught myself enough keyboard to add to the show. We worked ourselves up the ladder like a fledgling bands do. I remember once, we did 3 shows in one day. Travelling, set-up and performing and the load-out with no roadies. 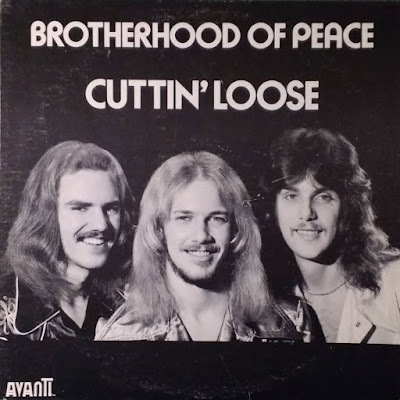 What circumstances led you to meet with Don Dixon and Robert Kirkland to record the “Cuttin’ Loose” material at Reflection in Charlotte? To these ears, the album has two very killer hard rock cuts in “Holiday” and “Candyland” yet also features melodic, power-pop moments seemingly inspired by the Beatles. Are there any interesting stories or fond memories from the recording session? We had all the music before the session ready to record except “Ready To Go”, with the slide and the talkbox and percussion added to add something different. 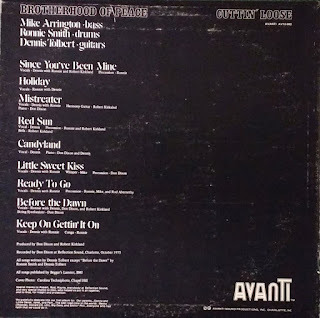 Some were power pop, “Since You’ve Been Mine”, hard rock, “Holiday”, “Candyland”, dance, “Little Sweet Kiss”, “Keep On Gettin’ It On”, ‘70’s rock, “Red Sun”, “Mistreater”, southern rock, “Ready To Go” and a power ballad, “Before The Dawn”. It was a real learning lesson watching Don and Robert and Rod as they worked with us on vocals, dubbing and seeing the production done from that perspective. What gear did you use on the record and for live shows? We used Sound City amps and cabs for guitar, Acoustic amps for bass and Ludwig drums. Gibson Les Pauls, Ovation acoustic and Hammond organ. A Gibson EB-3 bass and lots of percussion and congas. Pick some of your favorite songs and tell me the inspiration behind them. “Since You’ve Been Mine” the Beatles meet the Raspberries. “Holiday” Led Zeppelin. “Mistreater”and “Red Sun” Doobie Bros. “Candyland” Deep Purple meets Nazareth. “Little Sweet Kiss” Don said it was a good dance tune. I don’t recall the inspiration. 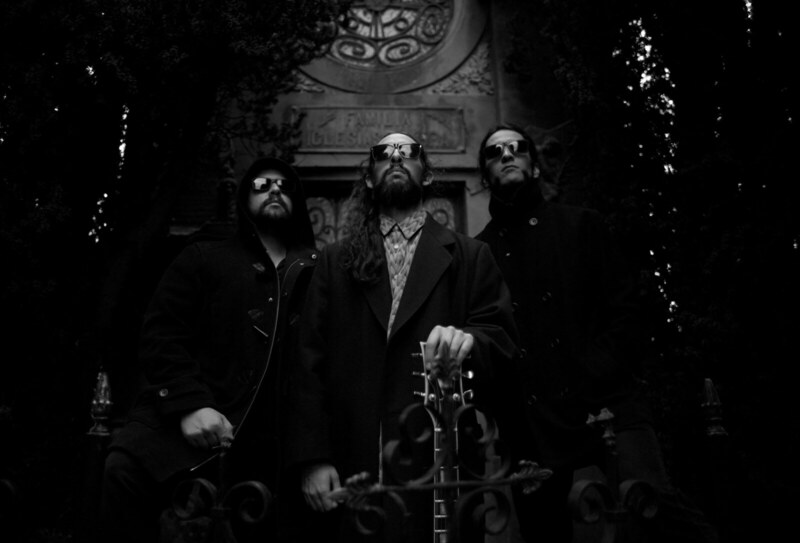 Mike Arrington’s whispered backing vocal was a signature part of the song. “Ready To Go” my nod to Lynyrd Skynryd. “Before The Dawn” our “Stairway To Heaven”. 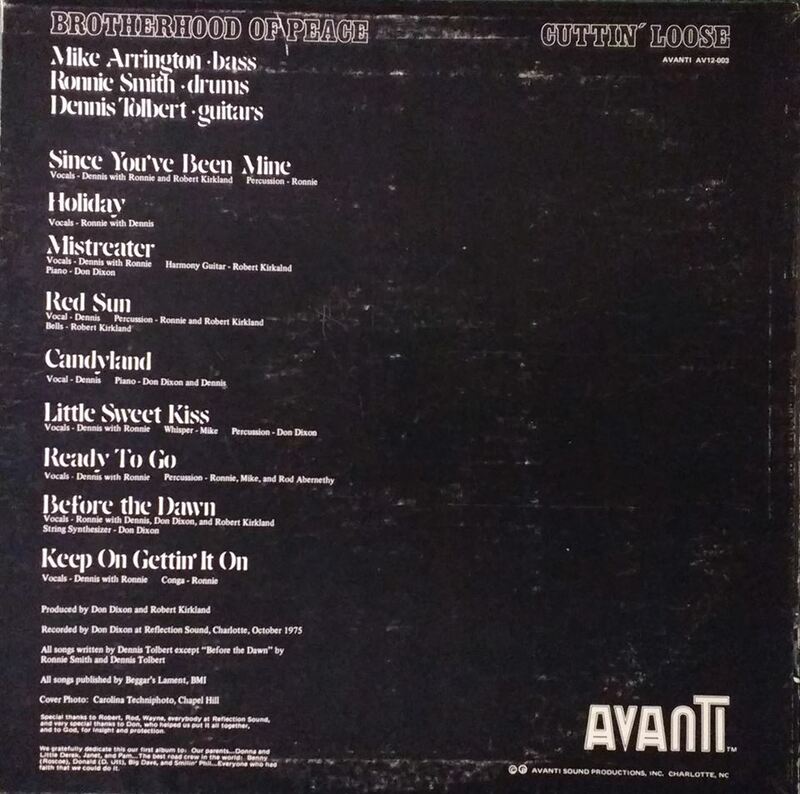 “Keep On Gettin’ It On” Grand Funk Railroad. How many copies were pressed of the album? I know 1975 is the copyright on the label. When was it released and where did you sell them? Did it end up in record stores? The original pressing was 1000 copies. It came out on March 27, 1976. The day my Mom passed away. What a time of mixed emotions. I got my LP, but I lost my biggest fan and supporter. I was 23 years old. We consigned them in stores. Sold them at shows. I think we donated a box to some distributor in Charlotte, but we never saw any sign of sales from this. Mike Arrington left in ‘77 and was replaced by Frank Scheper. I know there is a 45 from 1977 as well as the LP. 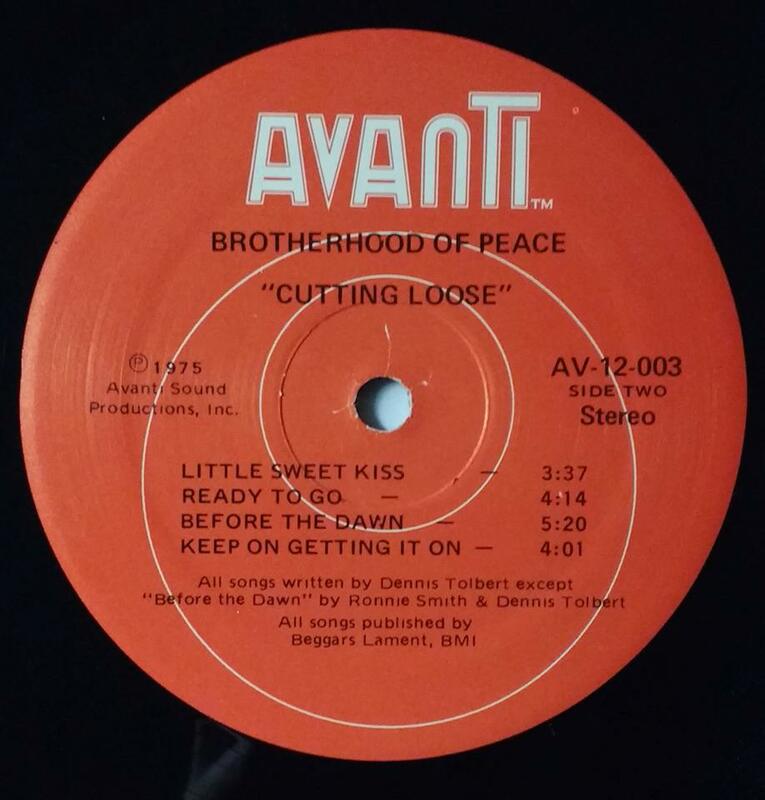 How long did Brotherhood of Peace stay together? Any interesting stories about gigging with popular bands? 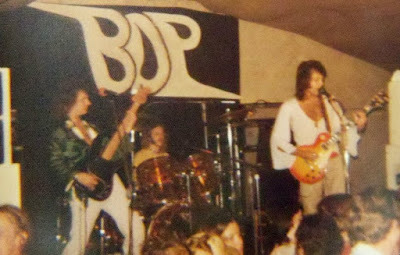 The 45 “Feel The Heat” (In The Driver’s Seat) and “Dance The Hoochie Koochie” were recorded at Reflection in Jan. ‘78 “Feel The Heat” was our rock/disco attempt that I wrote on a 2-track playin’ the top string on the guitar distorted to sound like David Bowie’s “Fame”. “Dance The Hoochie Koochie” had a hidden talkbox response in it and was pretty much a straight ahead rock song. We opened as I told you earlier for most of the Capricorn acts of that period. Blackfoot and Nantucket were there in fledgling times. We did shows with dozens of other regional groups like Glass Moon, Bull, Jesse Bolt and the same club and concert circuits as a lot of the more famous bands. We toured Florida for weeks at a time then. I think we were there maybe 3 times for 3-6 weeks at a time in ‘77. Playing with Blackfoot led me to a gig with the Dixie All-Stars in ‘93 for 2 tours. With members of Blackfoot, Molly Hatchett, Grinderswitch and the Outlaws rotating gigs. 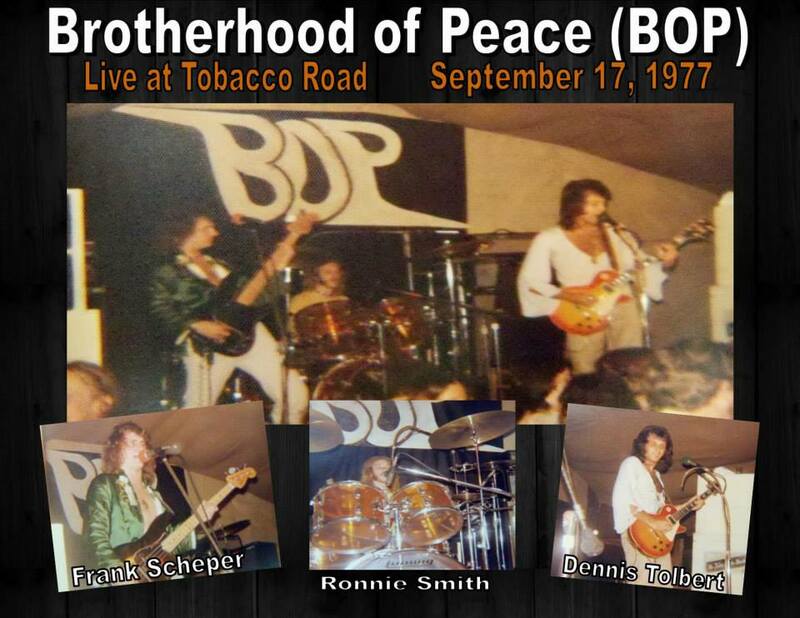 A great experience… Brotherhood Of Peace added more big shows with Head East, Mother’s Finest and about any other famous group. Frank Scheper left in late ‘78 and was replaced by Dale Williams. 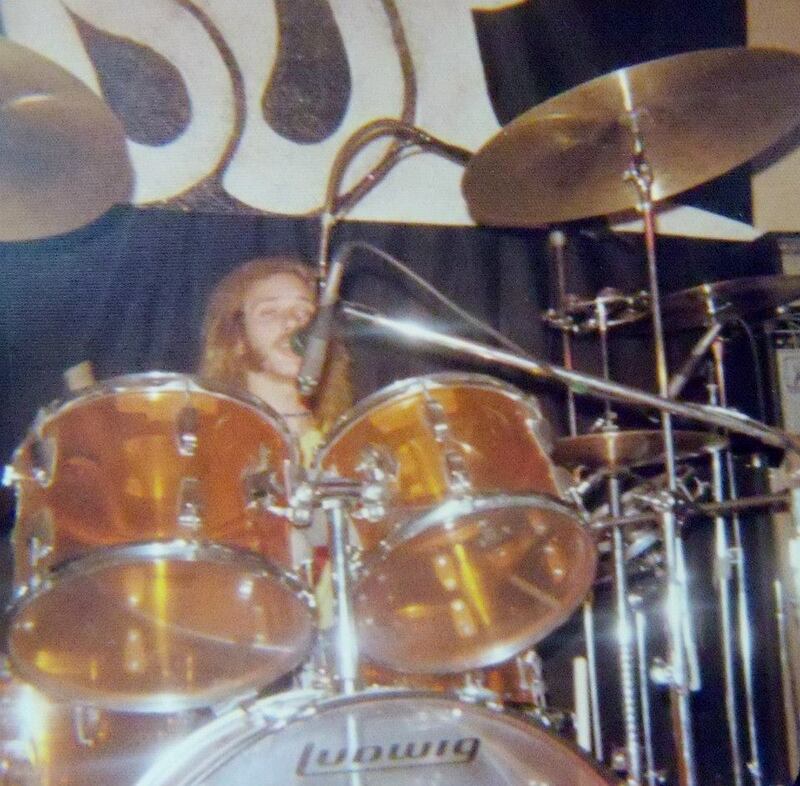 In May ‘79, we disbanded. We were young, self managed and didn’t have the connections that we trusted to go further. You continued to gig until the present time with the Dennis Tolbert Band. When did you form this band and what was your life like after Brotherhood of Peace? I went home to Mount Airy, moved back in with my Dad after Mom passed and for the summer of ‘79, I started writing again. By fall I was ready to go back out. I picked a young local band to back me up. We went through personnel changes quickly, but eventually another trio was born. I have gone through numerous changes since then but the spirit is still there for this music. 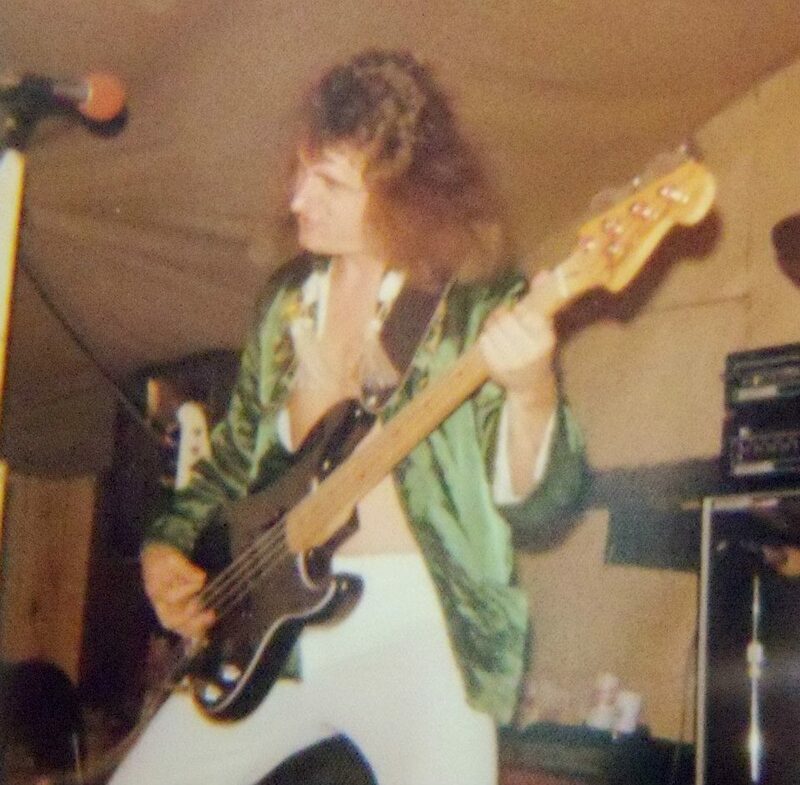 Throughout the ‘80’s and ‘90’s, we fought the disco/dj battles that were trying to kill live rock‘n’roll and we won and are still winning as we continue to perform every week. Awesome job Dennis! We love seeing your shows and being a part of your "family." You have an amazing talent and gift. Keep on Rockin' Us Baby!!! Nice interview and nice photos too. It's good to discover another band from Rock's golden age. Great article! It's nice to read the history & know you're still rocking...& even better to have such an awesome friend. I've known you since you started and we are still good friends. I remember your mom too. I enjoyed helping to save your gig at East Surry HS when you lost a bass player. That is still a great memory. I also have enjoyed sitting in with your band from time to time as my health will allow. You are one of the best and one of the most successful with their craft that I have ever known. Keep on keeping on my friend! Rock and Roll!!!! I used to see BOP at the Switch in Raleigh. Great band. Also Jesse Bolt, Nantucket, Razz, Control Group. Fun times.